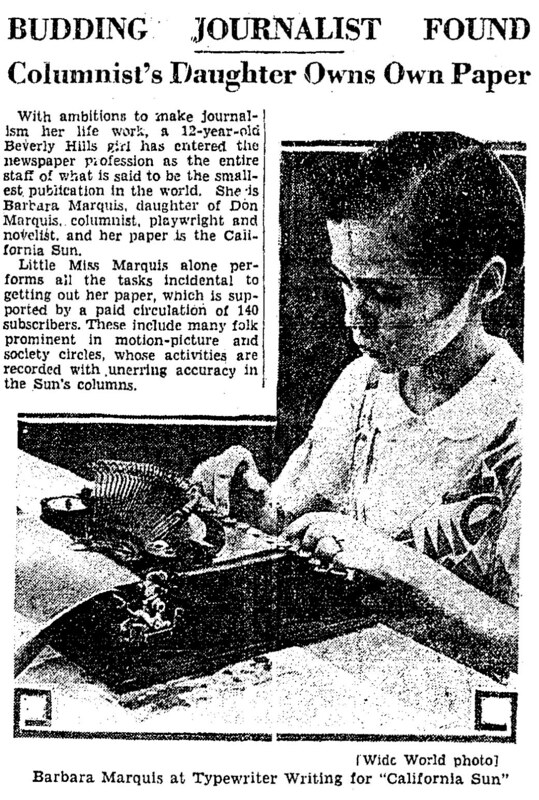 Like father, like daughter: Click on the news clipping at right — from the Aug. 19, 1931, edition of the Los Angeles Times — to read about 13-year-old Barbara Marquis, editor of the California Sun. Barbara was a sickly child, and Don brought her from New York to Southern California on the advice of doctors, who hoped the warm weather would help her grow strong. 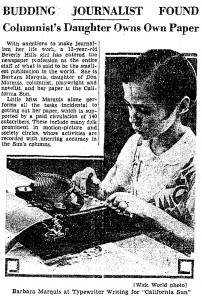 Don was working on screenplays for Hollywood studios at the time, and he lived with Barbara and his wife Marjorie in Beverly Hills. Sadly, the photo in the Times clipping may be the last one taken of Barbara. She developed bronchial pneumonia and died two months later, on Oct. 24, 1931. Her death sent Don into an emotional tailspin from which he never fully recovered. Check out the earlier blog post “A Photo From the Brooklyn Daily Eagle, 1920” for more on that. This entry was posted in News and tagged Barbara Marquis, California Sun, Don Marquis, Marjorie Marquis by John. Bookmark the permalink.